Our specialized rehabilitation unit offers residents physical, occupational and speech rehabilitation therapies six days a week. Through these services, residents work to regain confidence in their physical strength, fine motor functions and speech abilities while working with professional therapists. Our goal is to help you transition from hospital to home. Click here to find more information about Pro Rehab’s Therapy. 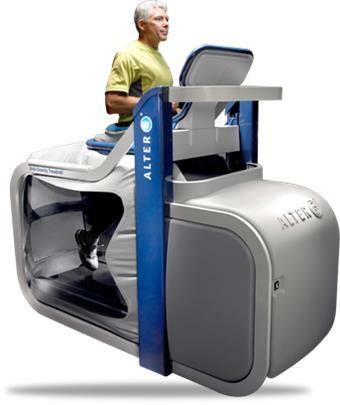 The AlterG® Anti-Gravity Treadmill® enhances our ability to help skilled residents recover faster. Provides our physical therapists a precise way to track patient progress, keeping patients engaged and motivated during rehab. Reduces body weight by 80%, through the patented NASA air pressure technology. This allows the ablity to walk freely and easily. This reduces stress and strain on joints, improving balance and control without fear of falling. Decreases “rehab to home” time. This state of the art technology is available NOW in our beautiful new health center – featuring both private and semi-private suites, restaurant style dining, and much, much more!